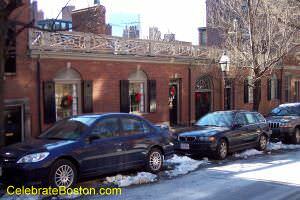 Located at 50 Mount Vernon Street on Boston's famous Beacon Hil neighborhood, is Thirteen Foot House (or grammatically correct, Thirteen Feet House). It is a single-story structure surrounded by taller brick residences. The building was originally three separate carriage houses owned by Hepzibah Swan, wife of James Swan, a revolutionary patriot. These carriage houses originally accompanied larger homes on Chestnut Street, and Mrs. Swan had given one to each of her three daughters. According to Boston Ways by George F. Weston Jr. (1957), the original deed of the property [c.1805] states, "The roof of the aforesaid stable shall never be raised more than thirteen feet above Olive Street [Mount Vernon Street]." Mrs. Swan lived on nearby Chestnut Street, and wanted to preserve her view up the hill to Mount Vernon Street. This height restriction also preserved views of Boston Common for homes on the north side of Mount Vernon Street. According to Historic Walks In Old Boston by John Harris (1982), part of Mrs. Swan's property between #50 and #60 was by deed required to be a horse passage from Mount Vernon Street down to stalls located on Chestnut Street. This author has been informed that the deed restriction is still in place, and the passageway still intact. Thirteen Foot House is a fine example of Federalist architecture in Boston, with a unique history. An amusing note is that several other carriage houses and stables presumably existed on the two streets, as Chestnut Street was at one time nicknamed "Horse-Chestnut Street." Scarlett O'Hara House, an optical illusion, is another unique Beacon Hill attraction located just a few blocks away on Revere Street.